YoBackend is a php backend support for YoVideo Android, YoVideo iOS, YoVideo Ionic, Yo365 . You can easy add and update video data (manage video, manage category, mange user). – Full Backend Source Code. – 6 months support from Inspius. For support of this app, please use our help center http://inspius.com/envato/forums/forum/extension/yovideo-php-backend, our technical will help you. All additional libraries that we use when writing code in our programs meet the MIT license and Creative Commons CC0 1.0 Universal, correspond to the free dissemination, modification and commercial sale. - [Update] Update permission when login. - [Update] Update description video support html format. Hello admin I buy this app and config complete all but when access url got Page Not Found this url: http://abc.com/yovideo/. what the problem? how to fix it? Hi There. Thank you for using our application. Please check your email. We have edited your comment to secure your website. This is an issue htaccess in root website. Please add this code to your root .htaccess file to make the sub folder website working. We will release an update tomorrow for the bugs fixed. In the mean while you can turn off the php error bugs to fix the issue, please check this link for more detail http://php.net/manual/en/function.error-reporting.php. It is just a notice. 1, when upload image sometime working find sometime error. Thank you hope get fix soon. The update version is ready now. We will update it tomorrow. Is there support for youtube channel/playlist? Current version does not support youtube channel/playlist. Thank you so much for that idea. We will take note and make it on future. Thank you for interest our application. We will release a new version of backend with function updated at end of this week, then the demo will be avail. You can check the screenshot for now. Yes the update for iOS version will be avail at end of this week. Good new. YoVideo Backend is supported YoVideo iOS. Please download the new YoVideo iOS version. Thank you for interest our application. Yes you can use direct link with the backend. 1. if i want to custom order : replace admob with startapp (mopub) , how much it cost? 2. About this option Install PHP Backend + Build App (Android + iOS)$10.00 : so you will build android+ios app? what file/data requirement for build it? maybe just like splash screen/logo/ads id etc? 1. For this custom, we will send you an email for detail. 2. Install PHP Backend + Build App is a service, inspius will help you setup the YoVideo PHP Backend to your server and help you install the android source code or iOS source code on your computer. The source code is from the items YoVideo Android or YoVideo iOS which you get from envato market. For now, yovideo android is not supported for sub category. But we will update an new screen for it soon. Can I upload video from this type of link like “Domainname.com/filename.mp4” or http://www.abc.com/video.mp4 (direct link file, not from youtube/vimeo).. 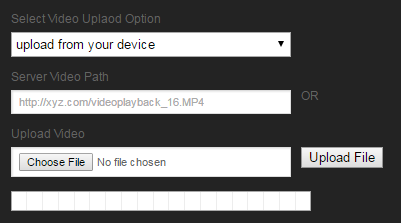 If .mp4 file is uploaded on Amazon S3 can i give link from it to uploaded video ? Thank you for interest our application. Yes you can use the direct link file with the backend, amazone s3 direct link file also working well. there is a way to let user add his videos / images to our app. Thank you for interest our application. It should be a custom version. You can send us detail of your requirement to contact@inspius.com. We will help you. Hello, Please create a ticket at http://inspius.com/envato so we can help you.